Ramakkalmedu is a small hill station at a height of 2500 feet above sea level, in Idukki District of Kerala. The rocks on top of the mountains after a kilometer of trekking can give Panoramic view of the plain valley in Tamilnadu and Tamil Nadu towns of Cumbum, Theni, Thevaram, Kombe, Bodinaykannor, Vaiga etc. Also seen are the view of Western ghats spread across the borders of Kerala and Tamilnadu. It is told that Hindu Lord Rama set his foot here and hence the name Ramakkalmedu. 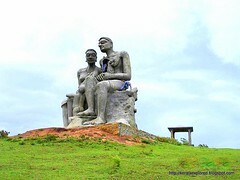 Kerala’s biggest statue of ‘Kuravan & Kurathi‘, a very beautiful stone state, of Sangam Period and Sangam landscape of Kerala and Tamil Nadu can be seen here at Ramakkalmedu. Kuravan and Kurathi has special significance in Kerala. Idukki dam, Asia’s highest arch dam and world’s third tallest arch dam, was conceived in 1919 and power generated in 1975. The Dam was build across Kerala’s longest river Periyar, which has an approximate length of 244 kilometers. Idukki Dam and Cheruthoni dams were built in such a way that Kuravan and Kurathi hills are on the two opposite sides and the other two sides are covered by the dams. Boat cruise is allowed inside the dam area. Its just three kilometers from Painavu, a small town and the administrative head quarters of Idukki district. Normally, boating is available only on Saturdays, Sundays and Public Holidays. During Onam Holidays (festival of the state) and during Christmas – New year season, boating is available on all days. Boating starts at 10 am and stops by 5 pm. Idukki dam made Kerala self sufficient in its power requirements for the decades after it was commissioned and still continues to be a major source of power for the state. These areas are rich in grass and bamboo trees. Winds blows at high speeds all through the year, irrespective of season, and this makes Ramakkalmedu an ideal ground for wind wills. There are a few wind wills installed already and many are planning to install new machines here. I have visited these places in 2000. Ramakkalmedu and surrounding areas have a large number of tourist spots.